Dark wood, dazzling details, leaded glass windows and tier after towering tier of books – classic historic libraries are a bibliophile’s dream. 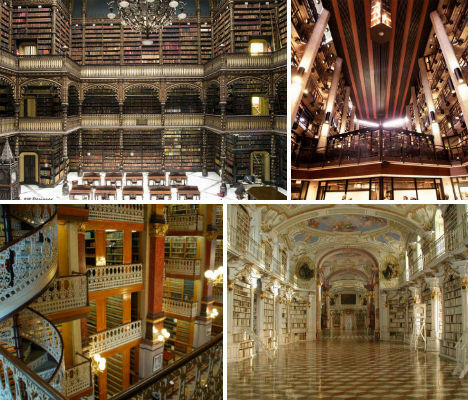 These 13 (more) libraries, dating from the 18th to the early 20th centuries, represent some of the most astonishingly beautiful book repositories ever built. 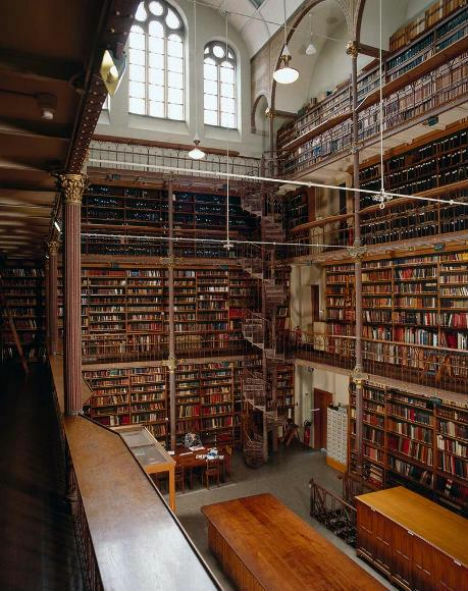 The largest public art history research library in the Netherlands, the Rijksmuseum Reading Room was formerly located in the stunning main Rijksmuseum building, established in 1800. It has since been mod to a new, separate building, but images of its tiers of books in a massive historic room continue to dazzle. 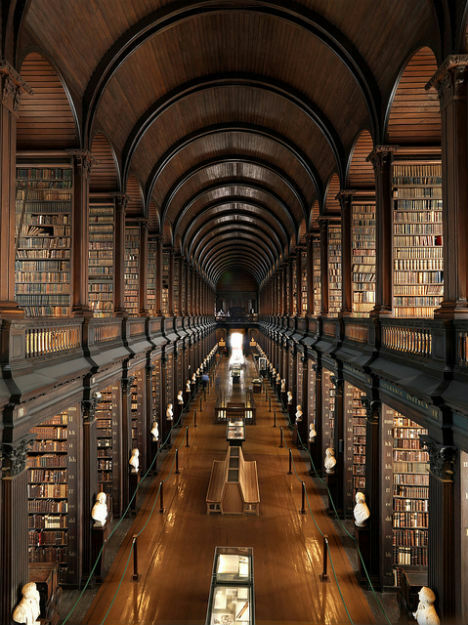 At Ireland’s oldest university, home to the book of Kells, the ‘Old Library’ stuns with its dark wood, spiral staircases and seemingly endless aisles of books. It was built between 1712 and 1732 and renovated in 1860 to include a barrel ceiling for a second floor of book shelves. 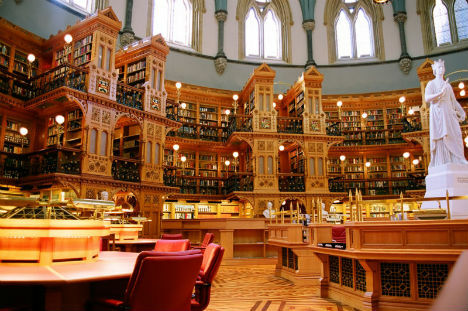 Canada’s LIbrary of Parliament was originally built in 1876 and is the only part of the Centre Block to remain untouched after a fire in 1916. Inspired by the British Museum Reading Room, this library features a massive main chamber with a vaulted ceiling. The walls and bookshelves are lined with intricately carved white pine paneling. 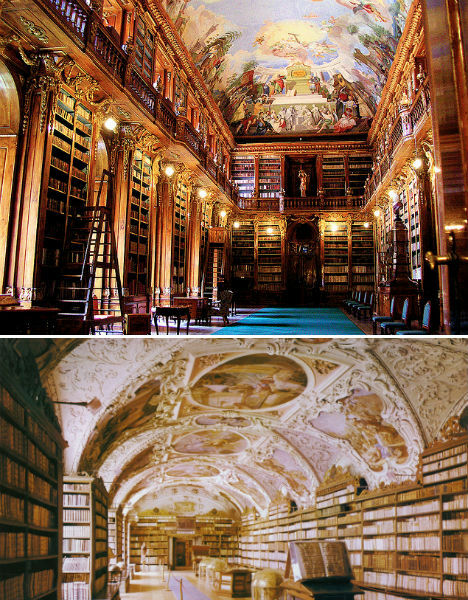 Part of a monastery that was established in the year 1143, the Strahov Monastery Library has a 46-foot ceiling decorated with a 1794 fresco entitled ‘The Struggle of Mankind to Know Real Wisdom’. It contains a vast collection of books as well as ancient printing presses. 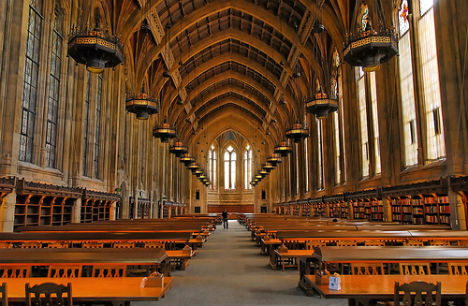 Completed in 1926 in Collegiate Gothic style, the University of Washington’s Suzzallo LIbrary contains an incredible 250-foot long, 52-foot wide Graduate Reading Room featuring a timber-vaulted ceiling, leaded windows and cast-stone ashlar wall blocks. 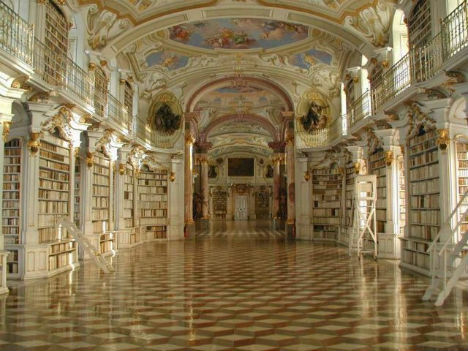 The largest monastic library in the world is located in Admont in Austria. Admont Abbey was founded in 1074 and settled by Benedictine monks, and the spectacular gold and white library was added in 1776. It survived a disastrous 1865 fire that destroyed the rest of the monastery. This dark and somber reading room contains an amazing 350,000 books. 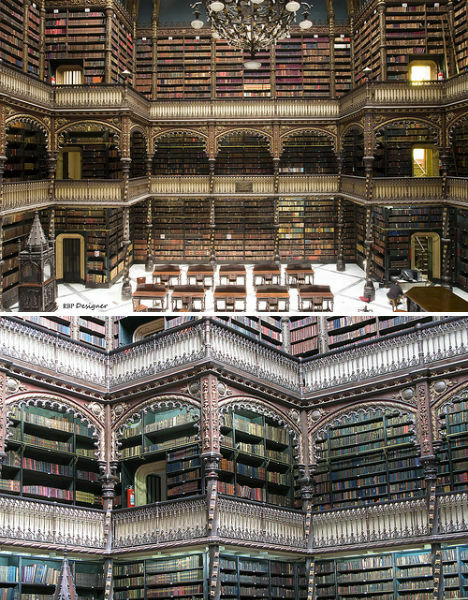 The Real Gabinete Português de Leitura was built in the Manueline Portuguese style in 1837 and is four stories tall inside for maximum book storage without a cluttered, maze-like floor. 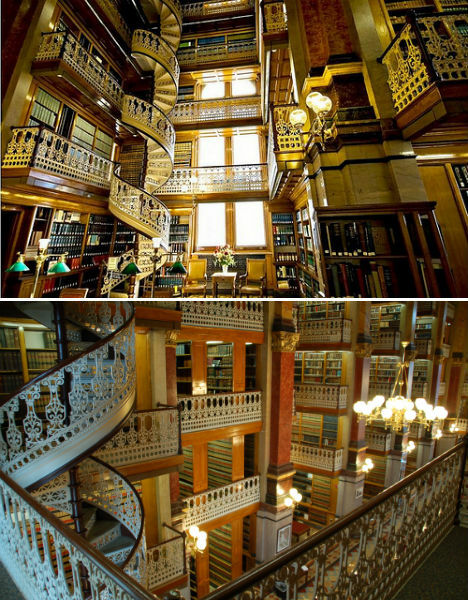 A lacy white banister flows along tier after tier of books and down a beautiful spiral staircase at the Iowa State Capitol Law Library, located in the Capitol building. The library provides Iowa lawmakers, lawyers, government employees and the public with a specialized legal collection of treatises and law books. 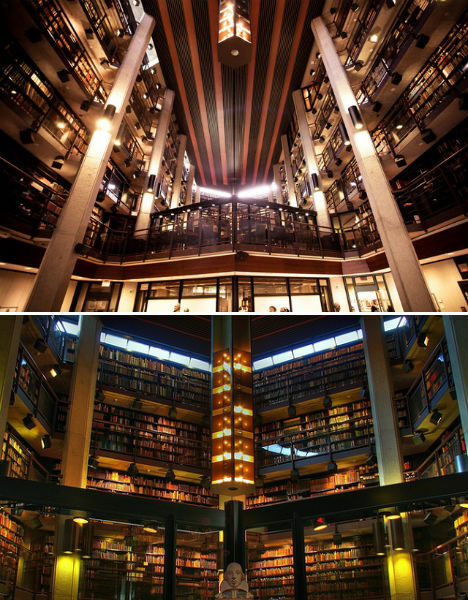 The Thomas Fisher Rare Book Library is located at the University of Toronto, and is the largest publicly accessible collection of rare books and manuscripts in Canada. It contains Darwin’s proof copy of On the Origin of the Species among other notable works. 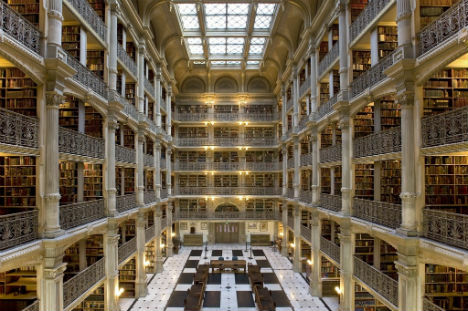 One of the most beautiful libraries in America is located in Baltimore. The George Peabody LIbrary opened in 1878 and contains five tiers of ornamental cast-iron balconies rising to the skylight 61 feet above the floor. It contains 300,000 titles, most dating from the 18th to early 20th centuries. 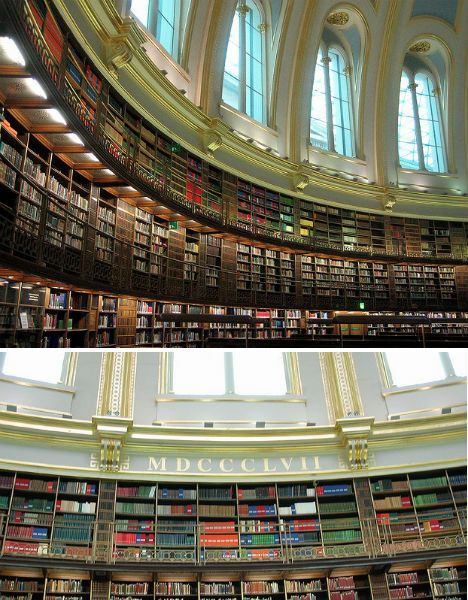 At the heart of the British Museum is the Reading Room, completed in 1857 and restored in 2000. Considered a masterpiece of mid-19th century technology when it was built, the reading room was inspired by the domed Pantheon in Rome and measures 140 feet in diameter. The original gold, blue and cream color scheme was reinstated during the restoration. 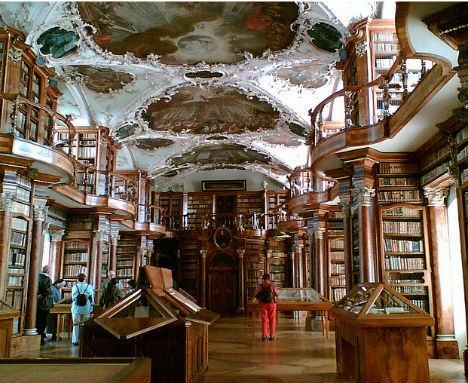 The library at the Abbey St. Gall in Switzerland is the country’s oldest, and considered one of the most important monastic libraries in the world. Its 2,100 manuscripts date back to the 8th through 15th centuries, and it also contains 160,000 books. The library, along with the rest of the abbey, is now a World Heritage Site as an ideal example of a Carolingian monastery. 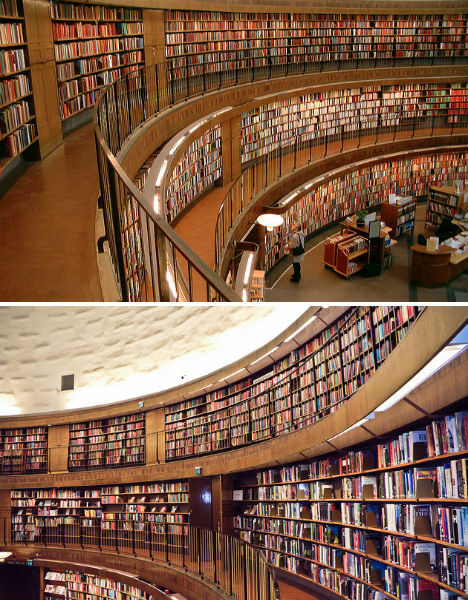 Stockholm’s rotunda library building, designed by architect Gunnar Asplund, was completed in 1932 and is still considered one of the city’s most important buildings. It is primarily comprised of a round lending hall in a tall cylindrical shape and also contains interior reading rooms. Polished black stucco gives the entrance a dramatic flair, and the hanging chandelier captures lights from the high clerestory windows. 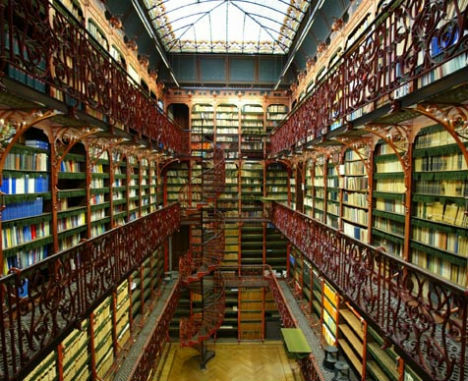 The Old Library at the Dutch House of Representatives contains volume after volume of verbatim reports of parliament proceedings and debates. The roof was constructed as a leaded glass dome to allow daylight to filter down the four stories to the floor, which was necessary at the time it was built in the 19th century to avoid bringing combustibles like candles and gas lamps from setting the 100,000 volumes on fire.